There will always be a great battle between Canon and Nikon. Each has a fierce loyalty from the faithful in their camp. However, each company has a compelling offering in the camera market and the Canon EOS 6d vs Nikon D750 is one of the most epic comparisons available today. Of course when considering the Canon EOS 6D vs Nikon D750, make sure you look at the overall ecosystem, not just the cameras themselves. If one offers a lens that you want and the other doesn’t that helps to make a purchasing decision a little easier. 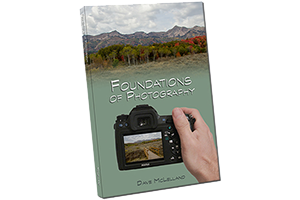 The Canon EOS 6D and the Nikon D750 are both “full frame” digital SLR cameras. The sensors in these cameras are both 24mm by 36mm, which is the same size as traditional 35mm film. Larger sensors offer advantages in overall image quality, especially at higher ISO settings. But which camera is better? As far as image quality is concerned, both are excellent, and I don’t see any differences that would lead me to select one over the other. Both cameras are very similar in size and weight, however, there are design differences that will affect how each feels in the hand. For photographers with smaller hands they may appreciate the slimmer grip on the Nikon D750. Both cameras also offer built-in WiFi. However, the Canon mobile app offers more camera control than the Nikon app. Both cameras are able to acquire autofocus in very low light (-3ev) which is pretty much equal to the light at night under a full moon. This is great for photographers who like to shoot in low light or at night, especially when coupled with fast prime lenses. Another feature that I like on the Nikon D750 is the second Infrared Remote on the rear of the camera. This may not seem like a big deal, but I like to use a tripod and shoot with a remote to minimize camera movement during longer exposures. Having a remote on the rear of the camera allows me to trigger the camera without having to aim the remote at the front of the camera. I also like that the mirror lock-up function is directly accessible from the drive mode control on the top of the camera. The Canon 6D has mirror lockup, but it is buried in the menus, requiring several button presses to turn it on or off. The Nikon D750 is deeper due to the flash housing. 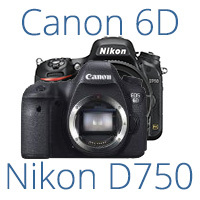 The Nikon D750 appears to have a lot of advantages over the Canon EOS 6D on paper. However, when comparing these two cameras be sure to look at the overall system as well. Canon and Nikon both have compelling lenses that the other does not. In the end the decision between these two great cameras may very well come down to one offering a lens you want/need that the other does not. Be sure to also handle both cameras as you may like the feel of one over the other if the lenses you want are available in both systems. 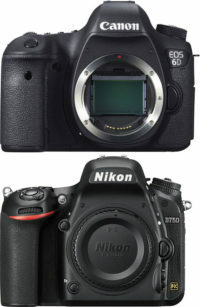 Looking at the overall user reviews, the cameras are pretty much even, with the Canon scoring 4.74 out of 5 stars and the Nikon scoring 4.73 out of 5 stars (at the time of this review). What is interesting to note is that more reviewers gave the Nikon 5 stars than the Canon, but also that more reviewers gave the Nikon 1 star than the Canon. DXO mark awarded the Nikon D750 a score of 93 on their scale (link) but only gave the Canon a score of 82 (link). DP Review awarded the Nikon D750 90% (link) and the Canon EOS 6D received a score of 83% (link). My overall recommendation: If you already own Canon full frame lenses – get the Canon. If you already own Nikon full frame lenses, get the Nikon. If you don’t own full frame lenses from either system, then I tend to lean towards the Nikon. I like the tilt screen, dual cards slots, more advanced autofocus system and built-in flash on the D750. If you enjoy using fast prime lenses then Nikon currently offers a full range of f/1.8 lenses (20mm, 24mm, 28mm, 35mm, 50mm, 85mm) that are very compelling and not outrageously priced. Canon has a few of these covered (28mm, 50mm, 85mm, 100mm), but many of these lenses are older designs that can use an update. As far as image quality and even the Mega Pixel difference, most people can’t really see much difference between the 2 cameras. Ultimately you will be happy with either camera. This is the advantage of competition – it makes both companies better and stronger, we the consumers are the ultimate winners. based on 1905 user reviews online. based on 1041 user reviews online. Dimensions (WxHxD) 5.7 x 4.4 x 2.8 in. 5.55 x 4.55 x 3.07 in. Weight 1.65 lbs. 1.65 lbs. LCD Size 3 in. 3.2 in.